remember, when i moved into my apartment. i bought 9 objects that i love. some useful, some just beautiful for the eyes. some of the marble rubble, has been removed from the front of the building. look, top balcony. i put out a red tablecloth for the photo, of my space. 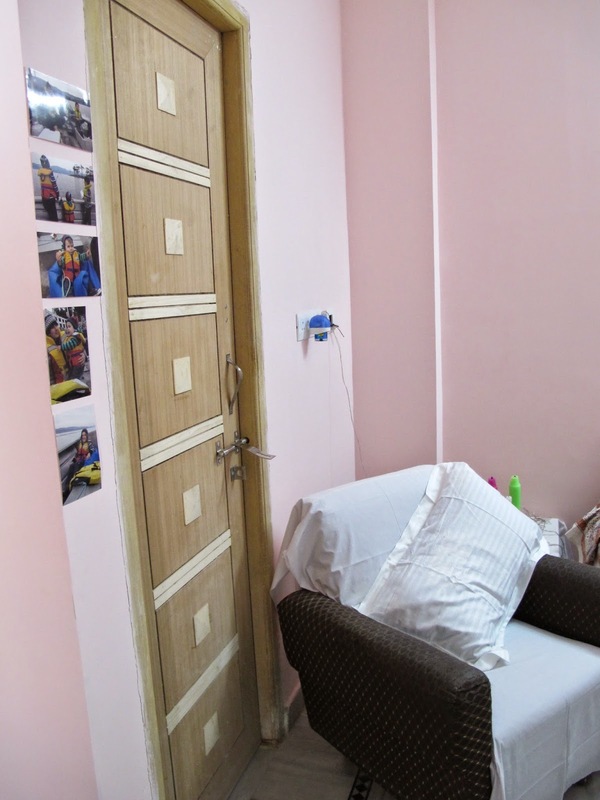 i have put photos of grandchildren on the wall. bought meters of white fabric, to cover as much of the brown as possible. 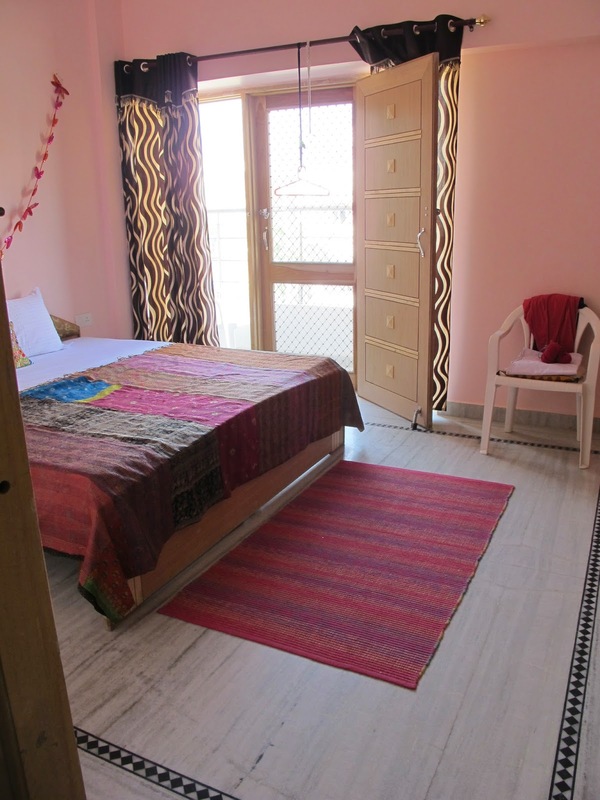 this door leads into the INDIAN STYLE bathroom..
i found this space very convenient as a storeroom. 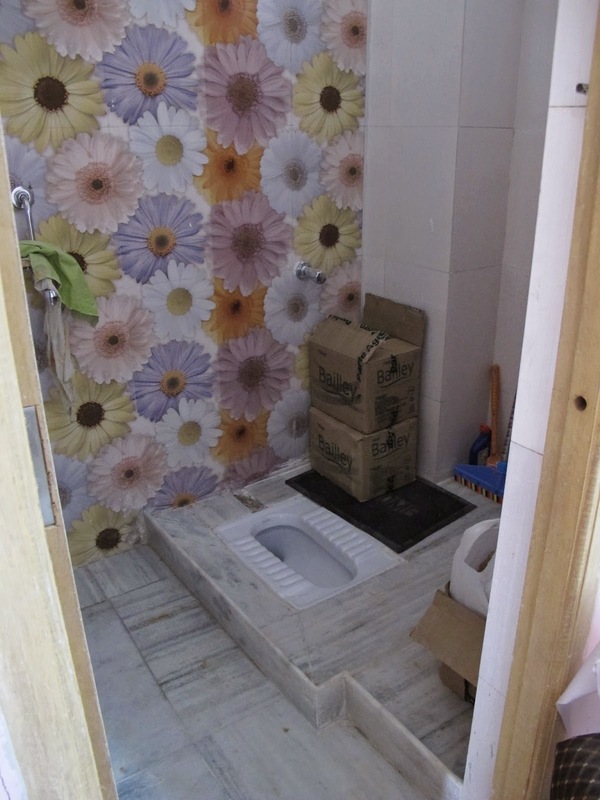 these bright, daisies tiles are a feature in the INDIAN STYLE bathroom. with respect i removed the brown pillows, and put in a cupboard. with respect i removed the cream lace covers, over the brown lounge. this BLOCK PRINT bed sheet, i bought @ I-INDIA @ JHAG VILLAGE. the TABLE COVER, i bought @ an ECO GREEN exhibition in DELHI. it is dyed & woven HIBISCUS FIBRE. the PEBBLES , i picked up along the road side in LEH. HIMALAYAN PEBBLES. 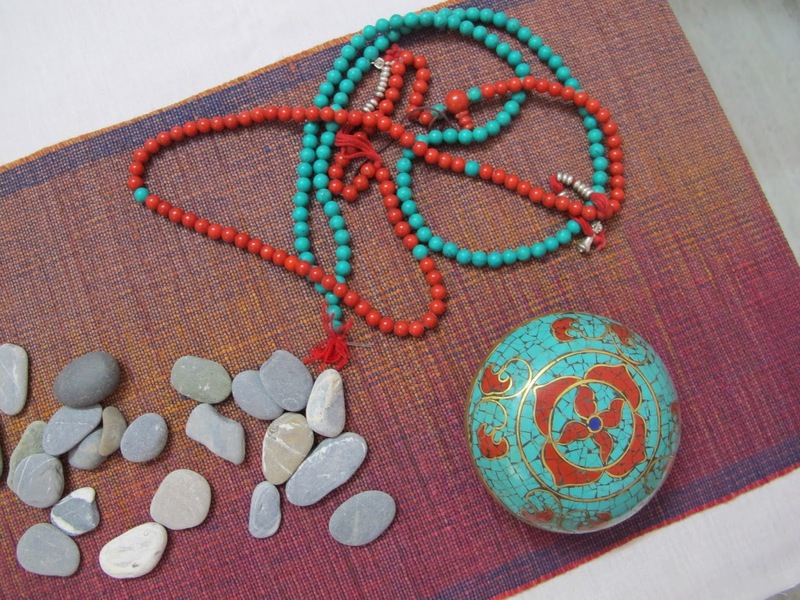 the turquoise and red coral lidded bowl, bought in LEH. the 2 mahala's bought in LEH. 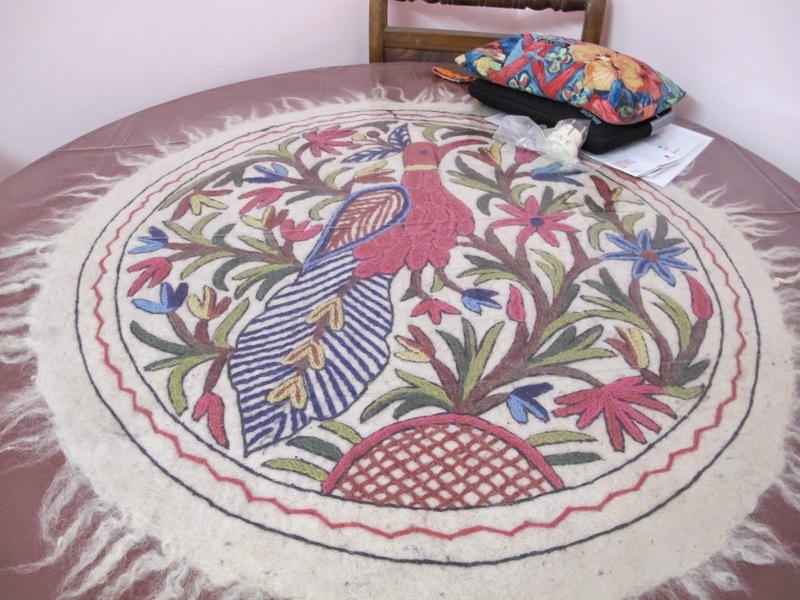 this is a wool , felted, embroidered mat. it is really a mat, but it was the right size to cover the table. then i bought a circular piece of plastic to protect it. 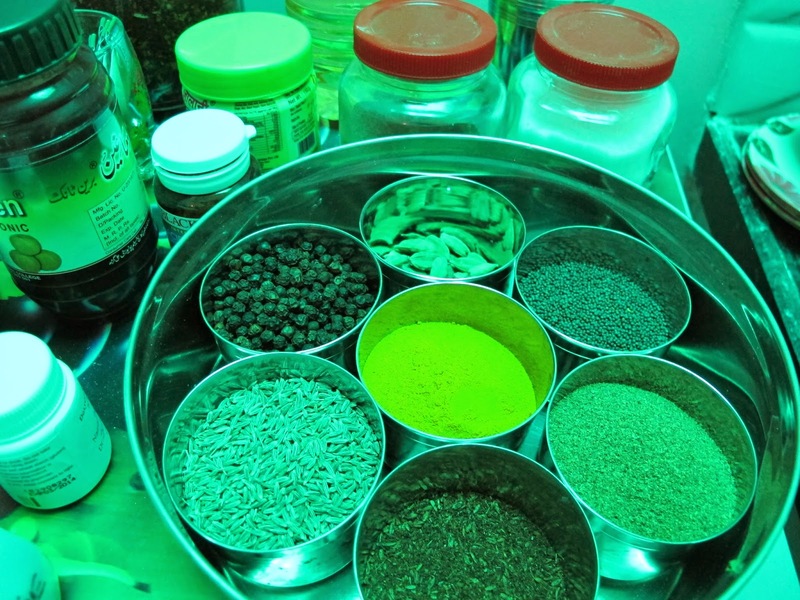 the round container in foreground, holding spices is a MASALA DABAR. 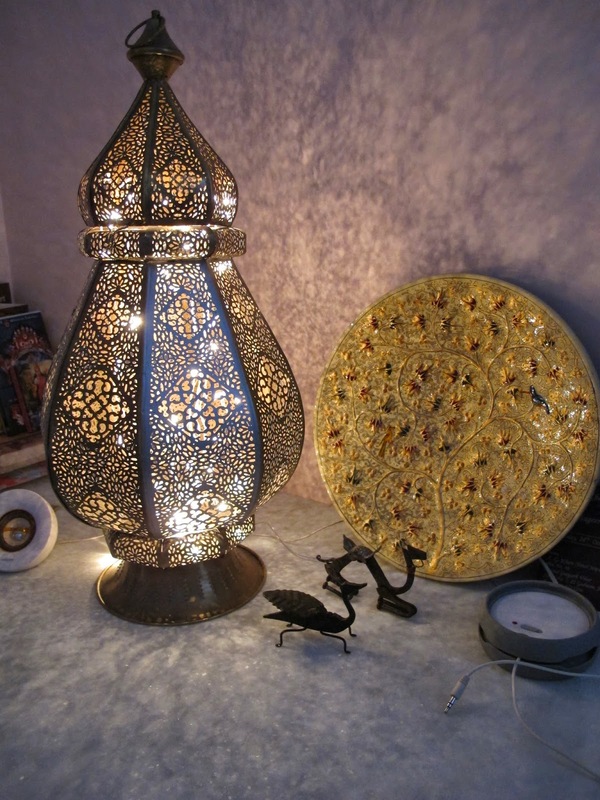 this beautiful, perforated, metal lamp, i bought in JAIPUR. you may recognise the PAPER MACHE 'TREE OF LIFE' wall plate. bought in SRINAGAR. the 2 METAL animals, bought in JAIPUR. i have a little collection of these works of art. they are constructed from old nails, screws, etc. what a difference PINK makes to a colour scheme. 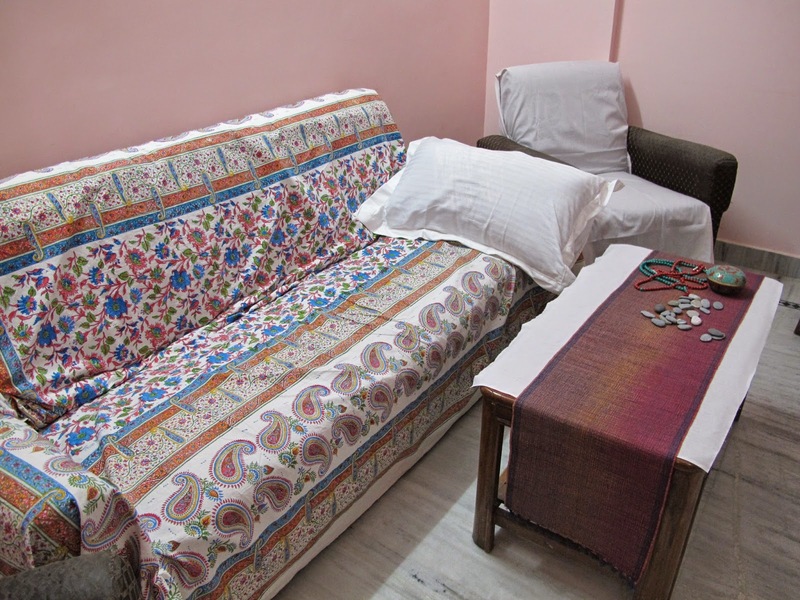 the SILK, KANTHA STITCH BED COVER, bought @ a TEXTILE EXH. 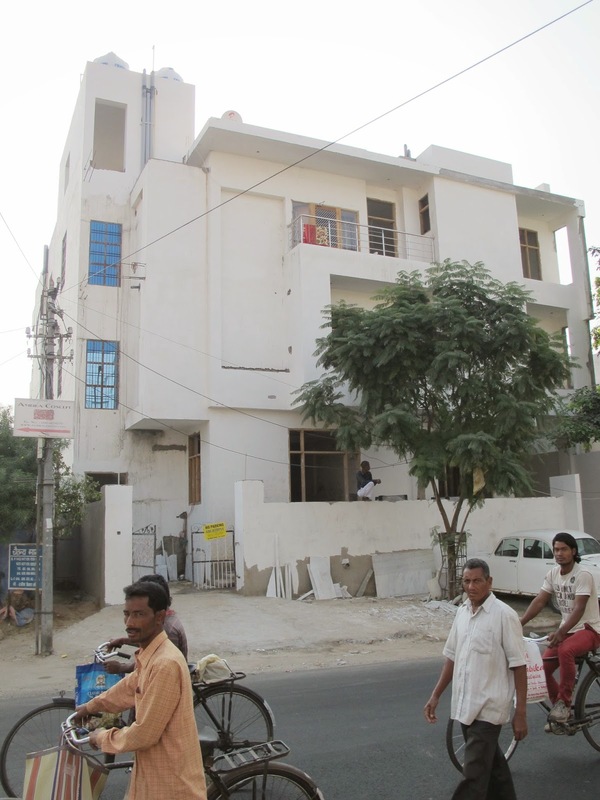 OUTSIDE OF JAIPUR. the cotton MAT, bought in DELHI. 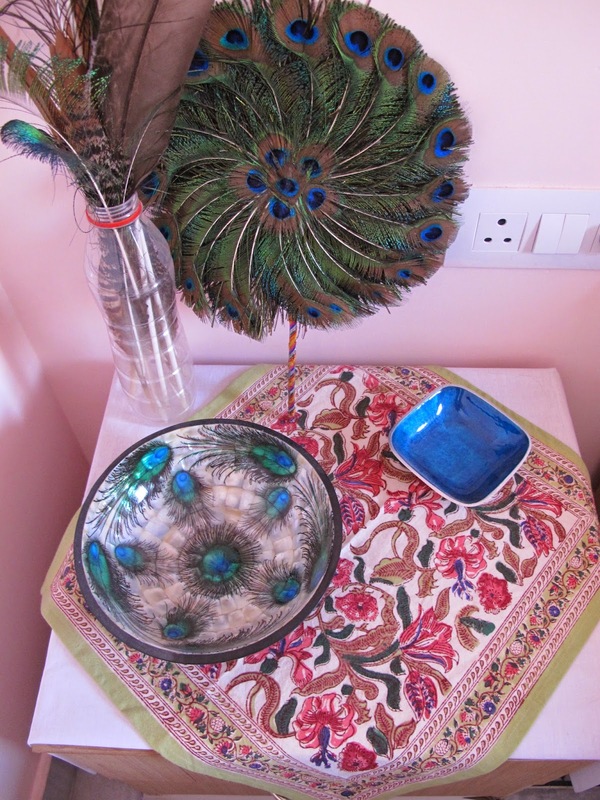 the FEATHERS in the make shift vase, myself, lili & daniel collected on our early morning walk at the BIRD SANCTUARY AT ALWAR. i have seen these on every visit to india. never bought one, as prohibited to bring into australia. NOW, was my opportunity to enjoy. the BOWL, is MOTHER OF PEARL,& HAND PAINTED . bought @ HAUZ KHAS exhibition space in DELHI. you would have to agree with me, what a difference a few personal items makes to our personal living space. my space went from drab brown to VIBRANT LIFE WITH COLOUR.